Cyndi Hasenstab shares her story of overcoming breast cancer. It was in December 2013 that Cyndi Hasenstab felt a lump in her right breast. She was on a ski trip with her family, and the day after Christmas she discovered the lump. Her doctor’s physician assistant thought it could be a fluid-filled cyst but wanted to have it looked at. Cyndi had a diagnostic mammogram that was unclear because of scar tissue. So she was referred to James Clanahan, MD, FACS, at Lincoln Surgical. Friends and family recommended Dr. Clanahan based on their experiences with him. Dr. Clanahan performed a breast biopsy, and the lump was cancerous. 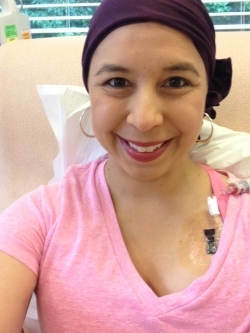 Cyndi was diagnosed with stage 3A invasive lobular breast cancer. Dr. Clanahan called Cyndi at 7:45 p.m. on February 3 to give her the news. Two days later she was sitting in a conference room at Lincoln Surgical to discuss her options. Dr. Clanahan explained not only the type of breast cancer Cyndi had, but he also discussed the other types of breast cancer. Did she ever consider receiving treatment in St. Louis? “There was no reason for me to go to St. Louis,” Cyndi said. “I felt confident in the treatment options we have here.” Dr. Clanahan and the entire team were very thorough and looked at multiple treatment options to ensure every cancer cell was gone. After surgery, chemotherapy, and radiation therapy, Cyndi is cancer free. She will be having the second part of her reconstructive surgery, removing tissue expanders and having implants put in, performed by Vidya Shankaran, MD, Lincoln Surgical’s new plastic surgeon. Cyndi, 44, is not only a survivor, she’s a wife, mother, grandmother, and eighth grade special education teacher, among other things! In fact, when she returned to school after her last radiation treatment, almost the entire junior high (about 400 kids) was dressed in pink to show their support for Cyndi!